Hi, welcome to The OBW in Poole, Dorset. I know what you’re thinking … another bed shop? Well, no. We like to think it’s a lot more than that! With over 20 years’ industry experience, The OBW is bringing you the best the UK offers, in style and quality, at a price that makes sense. 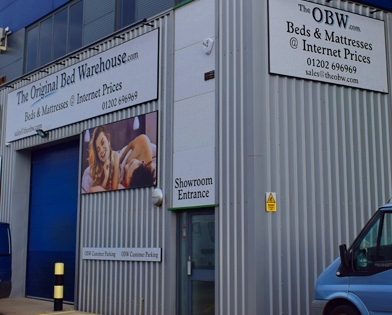 The OBW has two fantastic mattresses that we will let you try for 100 nights! This includes a no fuss returns policy if you’re not happy. There’s more info on our website too. We believe that the bedroom is a place of relaxation and style. So, we’ve put together a collection of beds that would suit any home. 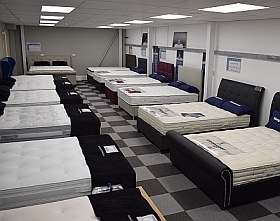 You’ll be able see a variety of bed frames, bases & headboard designs in our Poole, Dorset showroom, giving you the opportunity see the fantastic quality of the products we sell. Can’t see what you like in store? Not to worry. We have an online lounge area, set up to showcase our full additional catalogue on screen. So, we’re sure you’ll find what you’re looking for. We’ll even be happy to sit down with you, one to one, and find the right bed for your home. We often see things that we’d like to buy, but can be put off with that long wait for delivery. With us, it’s not like that, you like it, you buy it, and you can have it today. We hold large amounts of stock and offer a FREE same day delivery if you live within 20 miles of the store. So, how far does our commitment to customer satisfaction go? Well for starters, we’re offering FREE ‘same day’ delivery to all customers within a 20 mile radius of Bournemouth, Poole and Christchurch.! Live further than 20 miles away? Not a problem, we offer delivery lead times on all products that our own vehicles can’t cover, anywhere in the UK!! That’s FREE delivery too!! Thanks for taking the time to get to know us and we look forward to meeting you soon. ...and see for yourself, some of the fantastic offers we have available in store.